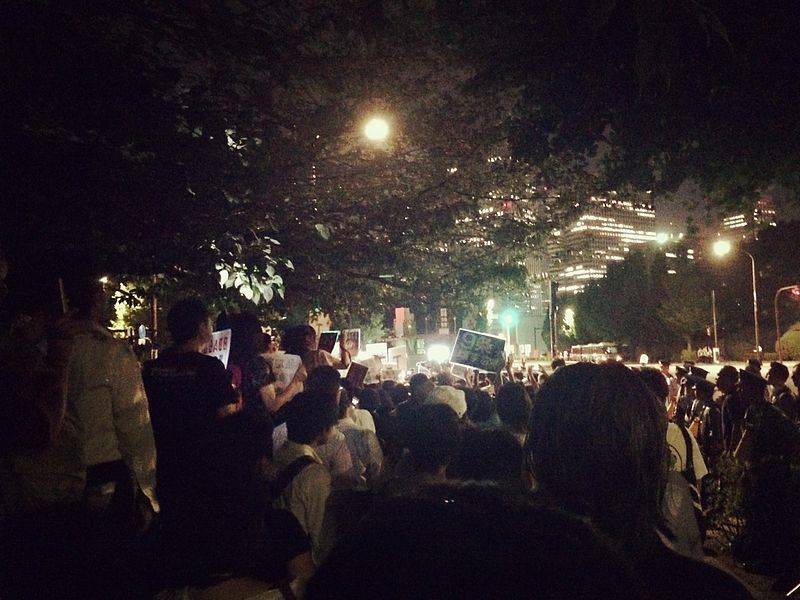 Protests in front of the Japanese National Diet (SEALDs). Photo source: Wikimedia Commons. In the late 1940s, in the aftermath of Japan's surrender in World War II, the Allied powers oversaw the creation of a new Constitution that would prevent the Japanese government from leading its people into another war. Most vital to its transformations was Article 9, which declared that Japanese would renounce war, and Article 11, which guaranteed human rights for all Japanese citizens, thus laying the foundations for a democratic government. A basic and ongoing challenge facing any democracy is that its citizens need to have free and open access to unbiased information and alternative viewpoints. Above all, citizens need to cultivate critical thinking skills, in order to make intelligent choices and decisions. But even semi-democratic nations can be misled by politicians with hidden agendas. Abe Shinzo poses as a peace-loving prime minister, both gentlemanly and courteous, even by the exacting standards of Japanese society, but his historical revisionism and desire to do away with constitutional guarantees of pacifism and human rights spell trouble for Japan’s democratic foundations. Rather than conveying unbiased political news, the Japanese media is often accused of covering up Abe’s meetings with ultra-nationalist groups and his past statements condoning the development of nuclear weapons within Japan. Despite the ongoing nuclear pollution that the Fukushima disaster is causing, Abe insists that relying on nuclear power is economically necessary and presents no unsurmountable dangers. In fact, in a very recent parliamentary debate, Yamai Kazunori of the opposition Democratic Party of Japan questioned Abe as to whether the Prime Minister’s confidence in nuclear power wasn’t directly related to the fact that residual fuel could be used to develop a nuclear arsenal. Perhaps the biggest obstacle that prevents East Asian countries from peacefully coexisting is the memory of Japanese atrocities during WWII. For example, at a recent trilateral summit, the leaders of China, South Korea, and Japan tried to work out an early resolution to the “comfort women” dispute, which deals with coming to terms with the history of Japanese colonialism's sexual abuse of women. When South Korean President Park Geun-hye argued that the Japanese government should consider compensating the victims who suffered sexual coercion under the Japanese colonial regime, Abe defaulted to the position of his ruling Liberal Democratic Party (LDP), saying the matter was legally settled in a 1965 diplomatic treaty. Eminent historians often argue that the Japanese people never came to terms with their war crimes to the extent that the Germans did.­­ In fact, on the 70th anniversary of World War II, nearly 200 scholars from various countries signed a statement imploring Abe to make a sincere apology that reflects genuine contrition. While Abe appeared optimistic about reaching closure at the summit, leaders and diplomats who spoke with him were dismayed by his apparent lack of empathy and compassion for the victims of these unspeakable horrors. Ever since Abe determined to force a controversial security bill through the Diet, legalizing Japanese military action overseas in aid of an ally, continual protests have been held outside the parliamentary building. These demonstrations are on a scale not seen since Abe’s grandfather, Kishi Nobusuke, who strengthened the US-Japan Security Alliance in 1960. 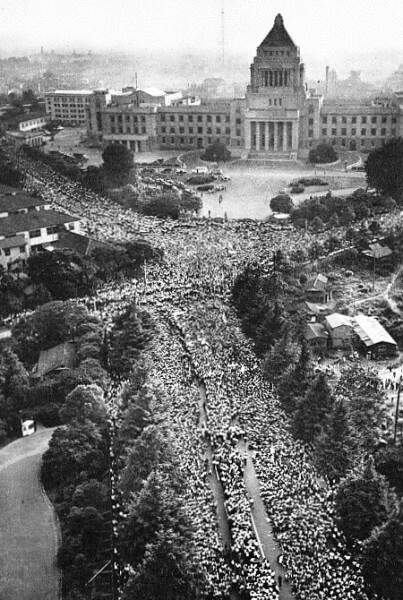 1960 Protests against the United States-Japan Security Treaty. Public domain. Pro-LDP media have tried to play down the scale of the protests, even though clashes between students and the police, reported on social media, indicate that they could potentially become riotous. But the Prime Minister enjoys a strong and loyal largely agrarian support base outside urban centers. The disproportional representation for rural voters in comparison with their urban counterparts means his approval ratings have remained steady throughout the current turmoil. Abe is also confident of the backing of the US military establishment, which wants Japan to shoulder some of its own defense burdens. Revoking Article 9 and amending Article 11, which guarantees human rights, are high priorities on the Abe cabinet’s agenda. The draft that the LDP prepared previously reinterpreted the human rights clause by emphasizing citizens’ duties and obligations to the state. Abe’s historical revisionism is emboldening nationalist historians, who are now arguing that the entire post-war Constitution was forced on the Japanese people. A visit to any major bookstore in Tokyo or Osaka will dismay non-Japanese residents, since book titles such as 『日本軍は本当に「残虐」だったのか』 (Was the Japanese Military Really Brutal During WWII?) and others are among the best-sellers. In fact, it was Abe himself who organized the research committee that argued there is no evidence to prove that the Japanese colonial regime coerced the so-called “comfort women” into serving the Japanese military. Western, Chinese, and Korean historians have provided hundreds of testimonies showing that indeed there was both torture and coercion, but the Japanese Army burned the most inconvenient evidence. Responsibility for the public’s ignorance of the Japanese military’s brutality lies at the doorstep of the Ministry of Education, a loyal LDP supporter. The Ministry is infamous for redacting war crimes from school textbooks and expunging the war period from secondary school curriculums. A week before the security bill was forced through the Diet, the Ministry of Education confirmed its plan to eliminate Liberal Arts programs altogether from Japanese national universities. The rationale is that these subjects do not profit the nation economically. Critical thinking, however, is the hallmark of disciplines such as history, philosophy, and political science and it's essential to any country hoping to maintain democratic freedom and human rights. In numerous interviews, the Prime Minister has stated that he respects above all others his grandfather, Kishi Nobusuke, who before being “rehabilitated” and elected prime minister was ruled a war criminal for his actions in Manchuria, where the Japanese Army carried out its most brutal Three Alls Campaign (“kill all, burn all, loot all”), not to mention the infamous live human medical experiments of Unit 731. By strengthening Japan’s military alliance with the United States, Abe hopes to check the rising power of China. Political analysts, however, point out that there is no guarantee that the US will back Japan when the Chinese GDP overtakes that of the US, and China closes the gap on military technology. In fact, Abe has recently volunteered to back the US Navy in its maneuvers. Confronting the Chinese in the South China Sea is comparable to the Cuban Missile Crisis in that it could unintentionally trigger warfare on a global scale—all it takes is a first shot. Naturally, these developments cannot be blamed on the LDP and the Prime Minister alone. Japanese citizens are responsible for apathetically electing the same party for nearly 70 years, or simply not bothering to vote. But now, new youth movements, as well as groups of concerned mothers, have hit the streets to speak out against remilitarization and oligarchic authoritarianism. Revitalized by grassroots protestors, some aged Japanese veterans of World War II are also coming forward to share passionately their bitter wartime experiences. 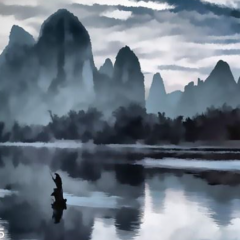 Jonathan Augustine has spent most of his life in Asia since the 1970s. He is active in theatrical projects and volunteer activities. His academic and fictional works include: Kyoto Artisans (2015), Shadows of the Atomic Bomb 『原爆の影』 (2013), Karakuchi Onna 『辛口女』 (2010) and Buddhist Hagiography in Early Japan (2005).